Hey guys! I've got another one of Pahlish's awesome monthly duos! The October set is called The Great Pumpkin duo and it's inspired by the famous Charlie Brown Halloween special. 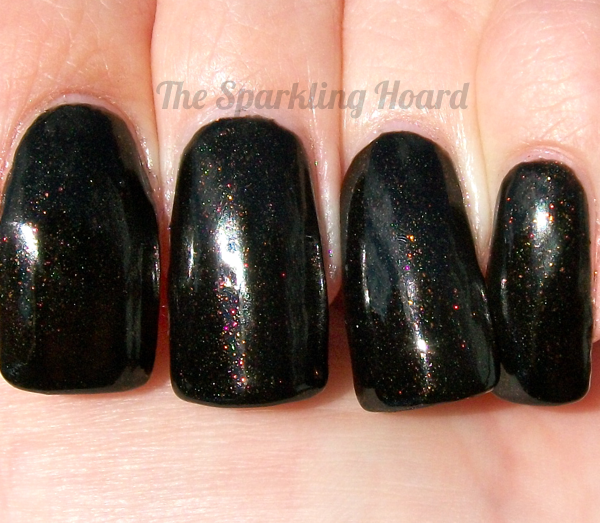 Most Sincere Pumpkin Patch is a black jelly filled with green, orange, and purple shimmer. You have to look closely to really see the colors of the shimmer (from a distance, it usually looks like a plain black or a shimmery black), but when you take the time to study it, it's quite beautiful. The formula is sort of syrupy, but adding thinner helps. I used two coats to reach full opacity. Dry time was average. 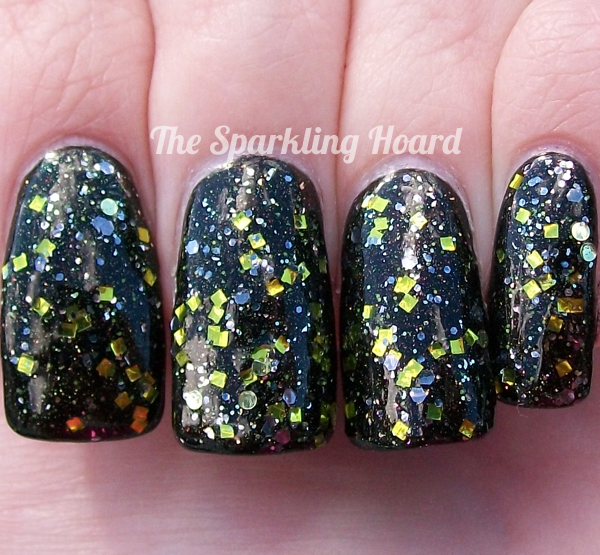 Bag of Rocks features gunmetal and chartreuse square, circle, and hexagonal glitters in a clear base. 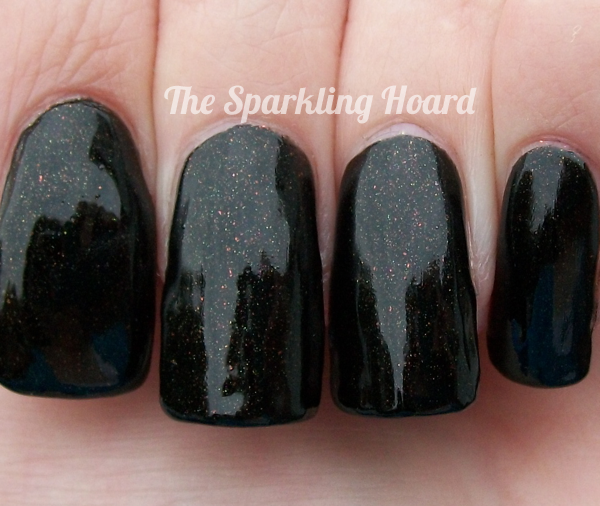 The formula is lovely and the glitter spreads evenly across the nail. I used one coat. Dry time was average. Sort of an edgy color combination, right? 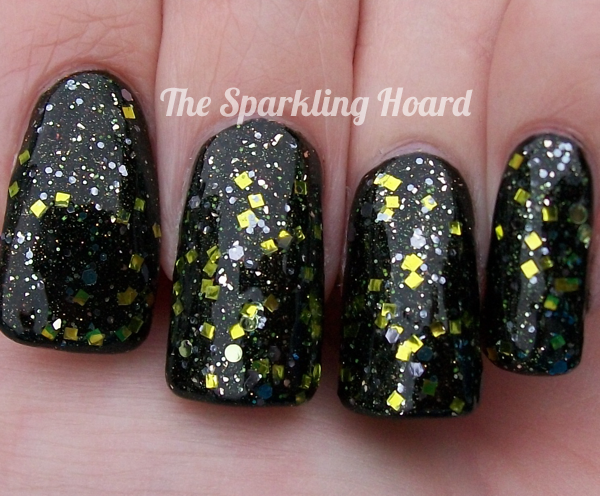 That chartreuse glitter is a real eye-catcher! I think this duo is a great option for people who want a look that fits in with the Halloween holiday, but don't want to go the typical black and orange route. Pahlish's duos cost $15 for two 15mL bottles of polish and are sold at Pahlish's online store. I believe The Great Pumpkin duo will be available starting on Friday, October 4th at 7pm Central. It will only be available during the month of October, so if you like it, make sure you grab it before November arrives! To stay up-to-date with the latest Pahlish news, Like the brand's Facebook page.